Imagine being able to put your hands out in front of you, palms facing one another. You press your forearms and palms against each other as hard as you can and immediately notice your chest popping; you can feel the muscle working all the way from your outer pecs to your inner pecs. You feel as though you could put a drinking glass on top of the damn thing. How does it feel? Pretty amazing I bet. Everyone wants a bigger, more developed chest. This should come as no surprise. But what does come as a surprise is that many gym junkies go to the gym week after week with the same exact chest routine, somehow expecting superhuman results when their consistency is not coupled with any type of variety or creativity. 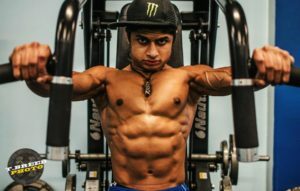 To successfully develop your chest, you need to know how to spice up your routines appropriately so that your pectorals are getting the stimulus that they deserve. Here are three techniques that can help you do just that. A partial rep by definition is a rep that stops short of the typical range of motion for a particular exercise. It is very easy to stop performing an exercise once you can longer complete a full repetition, however, there is still gas left in the tank! If you continue to perform the particular exercise with partial repetitions until you are no longer able to move the weight, then you know that you have truly exhausted the muscle and pushed it to its full capacity. So, back to the pecs. How can you leverage partial reps? Well, when you are doing any type of chest press, if you perform partial reps in the lower three-quarters of your chest press, you are reducing triceps involvement in the motion and maximizing pectoral muscle usage. With a spotter close by, perform as many reps of a chest press exercise that you can and then continue repping the weights out in the lower three-quarters of the motion until you can no longer push the weight up any more. This partial rep technique is very taxing. As such, I would recommend only using it for the last set of a particular exercise. Big negatives lead to big gains baby! I’ve always been a believer in eccentric training (building up potential energy in a muscle as you slowly stretch it during the negative portion of an exercise). When you release the stretch in your muscle as you begin the lifting portion of a repetition, the built up potential energy is transferred to the contracting muscle fibers. When you are performing a barbell chest press (incline, decline, or flat bench) and have selected a weight that limits you to 6-8 repetitions, perform 3 sets of 4 reps, taking a 4-6 second negative. A quick trick to realize strength and long term muscle mass is to execute a high effort lift on an exercise before performing working sets for repetitions. For the high effort set of the exercise, you will want to use a weight that you can typically only use for 2-3 repetitions and perform 1 clean rep.
Translating this over to chest development… situate yourself on a bench press and choose a weight that you can typically only use for two reps and do one set of one rep. Rest for about two minutes before performing a set with a weight that you would typically use for a set of 6-8 reps. You should notice that you can now actually perform 2-3 more reps as usual. Repeat this cycle two more times. There you go; 3 quick tips that you can easily implement into your chest training that will help you to get your shirts stretching out just in time for beach season! If you have any questions, feel free to reach out to me at shomo@shomoshotime.com. I am more than happy to brainstorm some good chest workouts for your particular frame, time constraints, and/or genetics. Or, you can alternatively check out some of the Online Coaching packages we have by clicking the link below! Each package comes with a meal-by-meal, workout-by-workout plan to get you where you want to be! Enter the promo code “GoldClub” for your exclusive discount. I’m looking forward to hearing from you all, and I’m excited to see some serious progress pictures thrown up on the web over the course of the next few months! Fruits – Friend Or Foe?